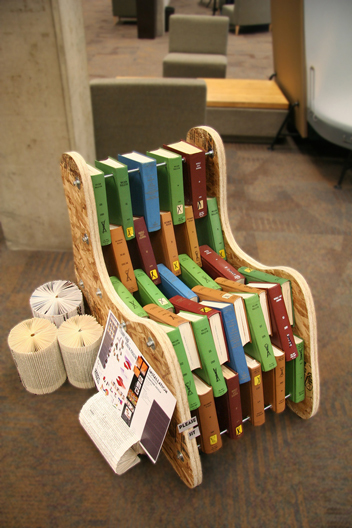 Reclaimed books chair, Courtesy Kennedy Library. Assembly Required highlights the craftsmanship and innovation of Cal Poly student furniture artists. 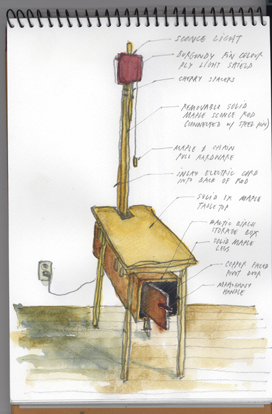 The winners from the 2011 Vellum/College of Architecture and Environmental Design (CAED) Furniture Competition and Exhibition are a central feature of the exhibit. Curated by co-organizer and Associate Professor Tom di Santo from the architecture department, the custom-designed pieces fabricated by the CAED students combine elegant craft with a reverence for sustainable design. The exhibit also includes pieces made from recycled books. Professor Tom Fowler (CAED) challenged his third-year studio design students to design and build furniture using books in a four-day period from start to finish. The result is a collection of inspired furniture that celebrates repurposed materials. Location: Robert E. Kennedy Library, Learning Commons 2nd floor. The exhibition is free and open to the public during regular library hours. Bedside stand, Watercolor courtesy Tom di Santo. Come and join us to get a hands-on lesson in the making of papercraft furniture. All materials are supplied and the papercraft assembly is open to everyone. Wonderful Thursday! It's 3:06pm right now.